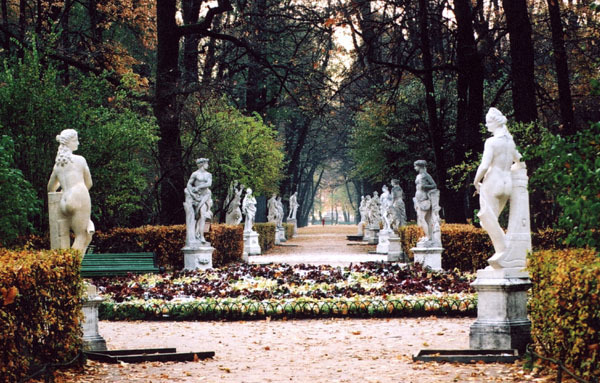 This is THE must-do run in St. Petersburg! Many of the city’s sightseeing and architectural highlights are its significant squares and gardens, several built around famous palaces, residences, and museums. 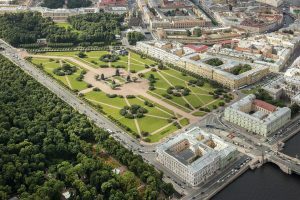 Seeing these St. Petersburg highlights makes for a fantastic 9 km run along the grand, wide-open paths of the Summer Garden, Field of Mars, Mikhailovsky Garden, Mikhaylovsky Square, Palace Square & the Hermitage Museum, and Aleksandrovskiy Garden. Paths along the river embankment connect these spots. 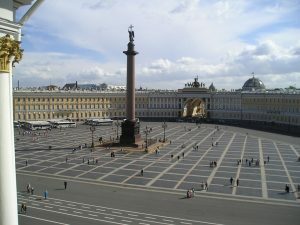 the Russian Museum, and run through Mikhaylovsky Square, a small park. Head EAST, toward Engineer’s Square, and then back toward the river along Klenovaya Ulitsa for the spectacular approach to St. Michael’s Castle, passing the Monument to Peter 1. Run around the square/grounds there, and then along the Fontanka river embankment into the formally landscaped Summer Garden, which is about 1 km down to the river. Here, at the 4 km mark, head west along the river path for 1 km to the Hermitage Theatre. Here, you’ll do a ~2.5 km loop around the Hermitage Museum grounds, Palace Square, the Winter Palace Garden, and then west through Aleksandrovskiy Garden/Park. At the western end of the park, turn along the path toward the river and the Bronze Horseman, a city landmark commissioned by Catherine the Great, named for a Pushkin poem & completed in 1782. The final 2 km is back east along the river paths. Add-Ons: Enjoy additional paths in the parks and gardens. Can also add with paths along the embankments of the Neva River, Moyka River, and Fontanka River.